Former Kansas University coach Mark Mangino says he’s “having more fun right now than I’ve had in a long, long time in coaching” during his first few months at Youngstown State, his alma mater. 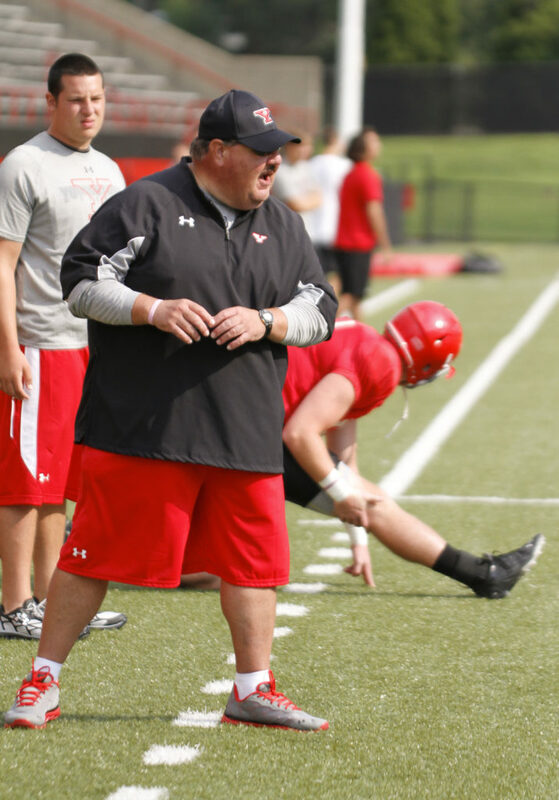 Mangino, seen here at YSU practice on Aug. 13, 2013, in Youngstown, Ohio, is the Penguins’ assistant head coach, tight ends coach and recruiting coordinator. Youngstown, Ohio ? The horn has blown on the first of two football practices in one recent mid-week day at Youngstown State. The head coach has spoken and the players head for water bottles and a path home for rest. After a few minutes, just two men remain on the field, one a chatty linebacker, another the assistant head coach/tight ends coach/recruiting coordinator. The coach knows the role he needs to fill at the moment is to listen. So he listens. The assistant head coach is known in this part of the country as “Bear,” his childhood nickname. Six seasons ago, he was known as the consensus national college football coach of the year, Mark Mangino, native of nearby New Castle, Pa.
Mangino, the last football coach to leave Kansas University with a winning record (50-48 in eight seasons) since Jack Mitchell in 1966, and the school’s only coach to appear in back-to-back bowl games, the only one to win three consecutive bowl appearances and the proud leader of a 2007 squad ranked seventh in the nation with a 12-1 record and Orange Bowl championship, heads to the bleachers to accommodate a reporter from Kansas. From his seat, Mangino can see signs of the slow progress of a once-booming steel town’s recovery from the depths of its crash. Dormitories near the football stadium stand where crack houses and houses of ill repute sullied the landscape a few decades ago. The well-read Mangino cites a story he has read from an economist in a Washington, D.C., think tank, one that predicts Youngstown will be among the northeast Ohio cities that 10 years out will have much better economies than today. Foreign companies, aware of an eager and skilled labor force, are relocating in the area. 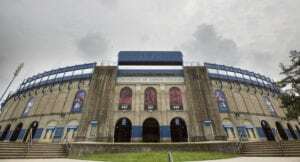 “It’s never going to be like it was, but there are definitely positive signs,” said Mangino, a 1987 graduate of Youngstown State who spent one season as a student assistant to Bill Narduzzi and one in a similar role on Jim Tressel’s staff. Sensing positive vibes as to a rough town’s recovery in large part requires relying on intangibles. The only tools needed to recognize the football coach is in the midst of a comeback are a pair of eyes. 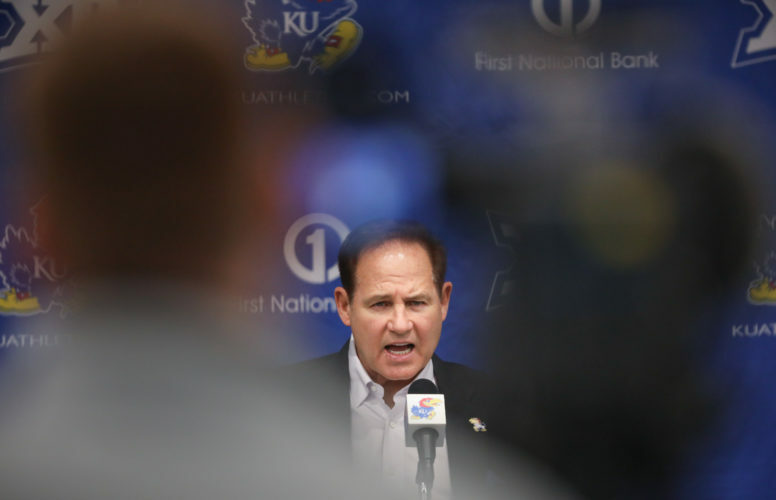 Mangino is a shell of his former self in an all-good way. 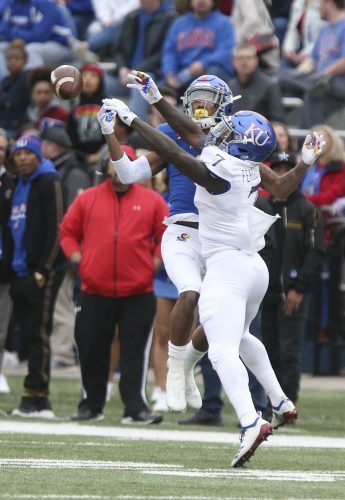 Eyes that haven’t seen him since his Kansas days required a second look to make sure it was in fact Mangino standing in the end zone fist-bumping a player. The ease with which he talked about his weight loss was nearly as shocking. Mangino was forced to resign after the 2009 season with a negotiated $3 million parachute after athletic director Lew Perkins launched a late-season investigation into his alleged mistreatment of players. Mangino’s wife, Mary Jane, was diagnosed with breast cancer two years ago. She since has been declared cancer-free and goes in for six-month checkups. Concerns over his wife’s health and lack of a job offer he felt was right for his career and family delayed Mangino’s return to coaching until, in advance of spring football, he accepted Youngstown State coach Eric Wolford’s offer to join his staff, a homecoming for Mangino. Mangino discussed his inspiration for losing weight. Former Kansas University football coach Mark Mangino directs players at Youngstown State practice on Aug. 13, 2013, in Youngstown, Ohio. 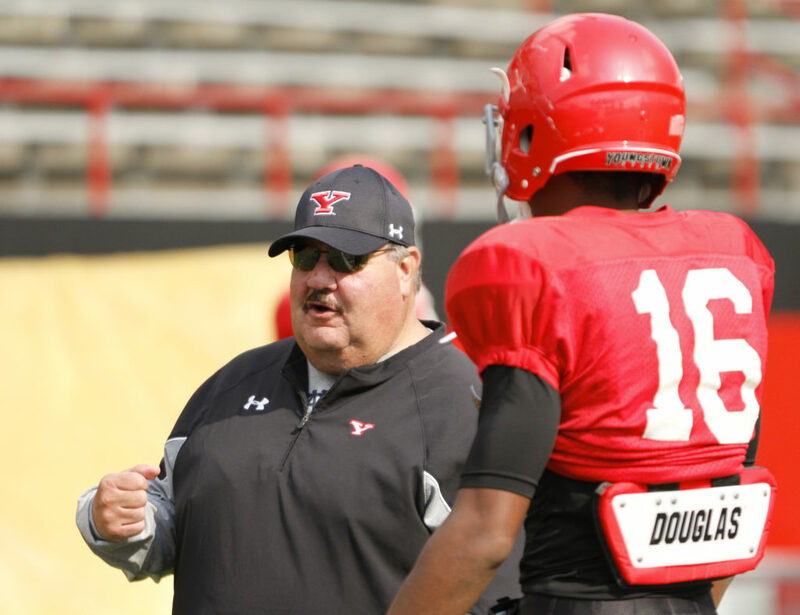 Mangino is the YSU assistant head coach, tight ends coach and recruiting coordinator. He doesn’t sport the drooping-skin look of some who have lost a great deal of weight in a short period of time. 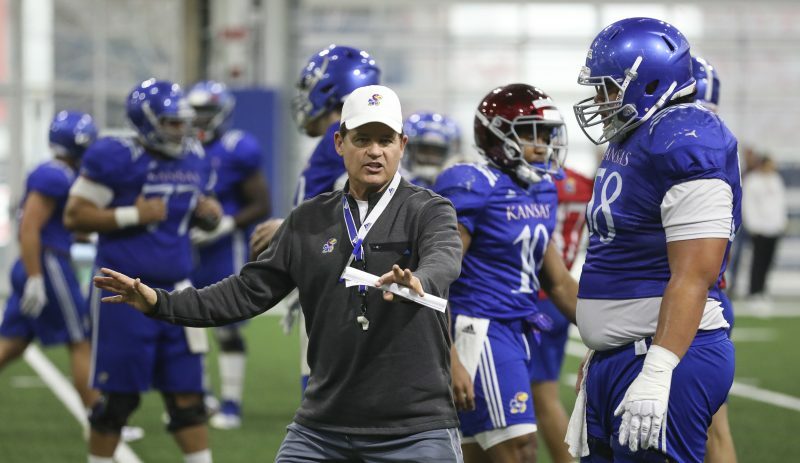 He just looks like a mini-Mangino compared to his days as the Kansas coach. Mangino’s first major weight gain came when he left Bill Snyder’s staff at Kansas State for Bob Stoops’ staff at Oklahoma. He moved ahead of the family and missed home cooking, so it came as no surprise when he cited the person most responsible for supporting his conditioning efforts of the past year. Even without much hope of an answer, the question had to be asked: How much have you lost from your peak weight to now? To listen to Mangino talk about his feelings about Kansas is to realize that he probably feels even lighter because he’s not carrying the weight of bitter feelings. Severance packages typically include clauses that prohibit the departing employee from trashing his previous employer, but Mangino seems motivated as much by maintaining a healthy state of mind as by fear of losing a healthy bank account. He knows what it’s like to carry around extra baggage. He didn’t like how it felt. His thoughts remain trained on where he is, not where he has been, he said. It wouldn’t take more than a pop psychology degree from a fortune cookie or bubble-gum dispenser to draw the conclusion that feeling so supported from every angle has made Mangino feel good about himself and in turn aided his weight-loss efforts. That doesn’t mean Mangino, 56, has pitched a permanent tent at his alma mater. He said, “I don’t know how long I’ll be here,” and did not hesitate when asked if he felt up to the challenge of taking on another head-coaching job. The “too-tough-on-the-players” label might shrink the pool of schools interested in pursuing a coach with a winning record at a place with a long tradition of losing football. “I’m not worried about the things I can’t control and I can’t control what other people say about me,” Mangino said. “I think it’s best if you’ve watched me coach, if you’ve seen me prepare, if you’ve seen my relationship with players, you’ll understand me and you’ll know what I do is in the best interest of the program I’m in, and I enjoy teaching and coaching. Penguins junior tight end Nate Adams remembered learning the news about his new position coach. 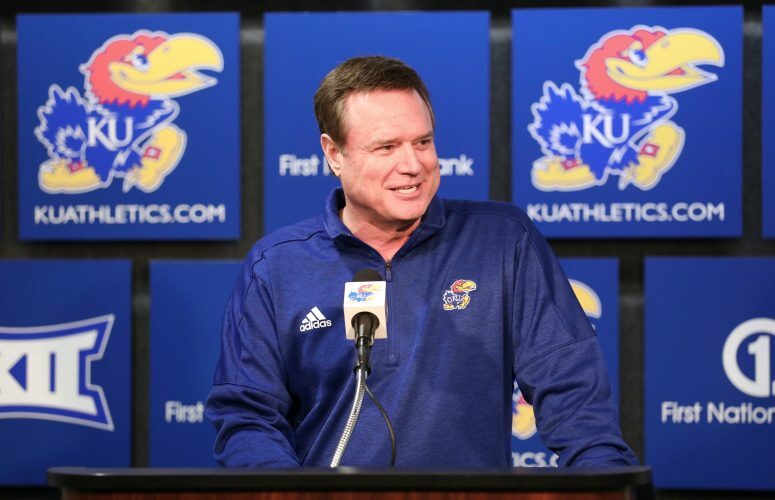 Adams laughed when asked if he found Mangino’s coaching style abusive. His tough reputation wasn’t a concern for his current employers. Youngstown State head coach Eric Wolford, 42, played for Bill Snyder at Kansas State as an offensive lineman when Mangino was his position coach. They also were members of Snyder’s staff at the same time. Before becoming head coach at Youngstown State, Wolford also worked on the staffs of head coaches Steve Spurrier, Ron Zook, Mike Stoops, Darrell Dickey, Dana Dimel, Jim Leavitt and Snyder. He was recruited to K-State by Bob Stoops. Wolford said that after he took the head-coaching position at YSU in 2010, Mangino was among the first he called for advice and he called him often. Without mentioning Lew Perkins by name or the specifics of the conditions under which he left KU — a ticket scandal not tied to Perkins but happening during his watch in which four people pocketed money for tickets and were sent to prison — Wolford expressed the opinion that Mangino’s relationship with his athletic director was the reason for his ouster. Youngstown State’s colors are red and white, but Wolford’s purple roots show often. Happy. The word hasn’t always been the first to roll off the lips of those describing Mangino, but now it seems to fit Mangino as well as those pants that have been taken out of the recesses of his closet after a long, sometimes stormy stay.